I have been using a new ladder since February. 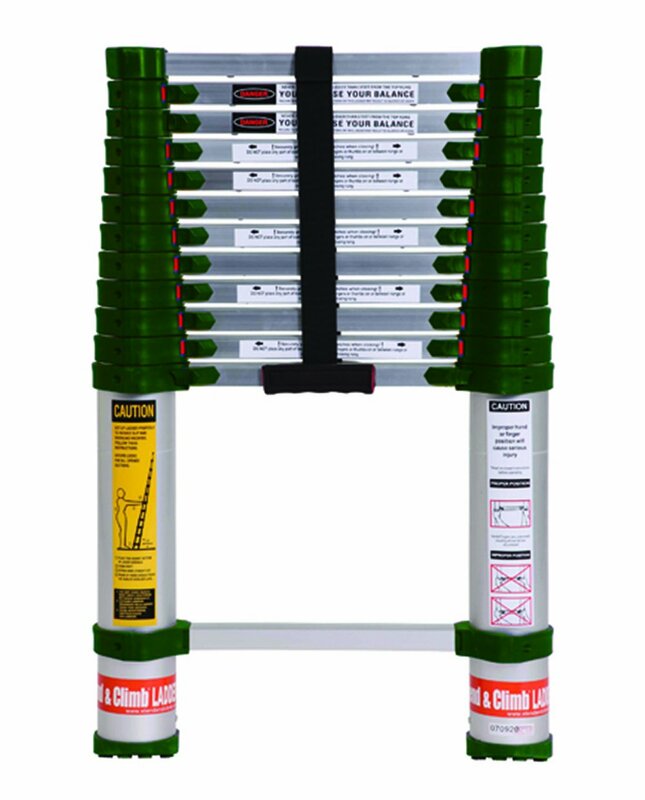 Xtend and Climb rated for 300 lbs and weighs 32 lbs, which is way lighter than my aluminum articulating ladder. You mean for inside? If the garage attic hatch is in the middle of the garage you're out of luck. Don't you find it too short for outside? They are good for certain application like tight closet attic access. No it won't work for two story homes, but I routinely use it to get on single story roofs. And yes it's easier to navigate the inside of homes including garages, too. Be very careful with that ladder. A few members have been seriously injured using one. I agree Chris-best ladder ever. Dave we have no trouble using it for attic hatches in the middle of the garage, or anywhere else for that matter. I also use the same ladder for interior attic access, love it. So much easier to carry through the house and set up in tight closets. I have this top cover for it so I don't mark up any walls. Do you have specifics on that statement, I've been using that same Xtend & Climb ladder for years and have had no issues with it? I know there are cheap copy cat versions with poor safety records. The last two rungs on mine has been hard to collapse for the past few months. I spray it often with silicone , but that only helps for a short while. I've had the feet slip out from under me a few times. I think those are the ones to steer clear from. I'm looking into one myself. I wanted the Little Giant, and my mother in law, with best intentions, bought this "take off" articulating ladder from Lowe's. I think the Little Giant was like 38 pounds, I'm sure this take off is 75 pounds or so! I****'ve had the feet slip out from under me a few times. I've been eye balling this one as my next ladder. Has anyone tried one yet? A lot of access doors require a step ladder to open the door and the an extension ladder to get up there. That is a great idea. That ladder will easily slip out as you are just starting the climb down. BEWARE **of any product where the BRAND is **not listed at least once on the information page!!! I searched... it is nowhere to be found!!! Gotta know who you're gonna sue when it fails and fuks you up! I agree, I love my Xtend and Climb ladder. It is not the only ladder I carry, but it's my first choice for inside and outside. I do 100% agree DO NOT buy the no-name knock offs. My local Home Depot has a knock off and it's death trap waiting to happen. It looks like the Xtend and Climb, but it's not built with the same quality. Plus Xtend and Climb's customer service is really awesome. A lot of access doors require a step ladder to open the door and the an extension ladder to get up there. I like my Tele-steps. 14.5 foot version as the 12.5 foot version could not reach the tall garage attic access areas without being straight up and down. The reason I like the Tele-steps more than the Extend N Climb is the wide step version they have available. With the amount of time spent on and off ladders, the wider steps are easier on the feet than the bar type steps. Lock system has been changed / improved.